Wind turbines in a neighbouring community, as seen from Amherst Island. Photo by author. Taking the sleepy barge which spans the short distance between Amherst Island and the rest of Ontario, visitors to this agricultural township are immediately struck by a looming juxtaposition. Dotting the otherwise screensaver-esque farmland-like bleached toothpicks dropped from above stand the imposing masts of twenty-seven wind turbines. Towering from a height of fifty stories, they dominate the horizon in all directions. In response to the Ontario government’s 2010 Long-Term Energy Plan, the province has seen a sharp increase in renewable energy projects. 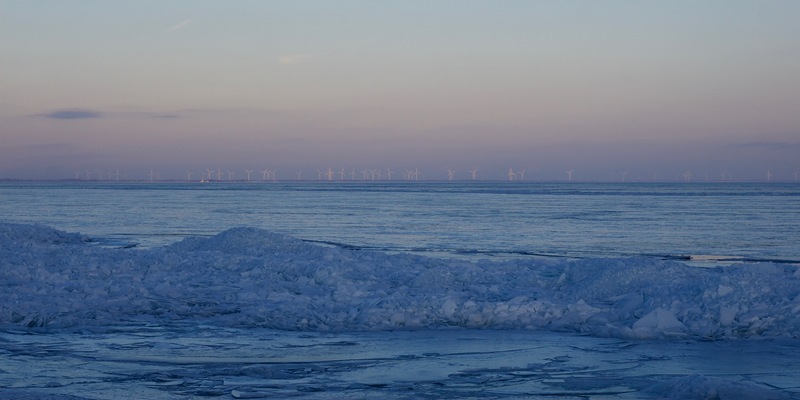 Seeking to build an energy grid which is 90% free of greenhouse gas emissions, the Amherst Island Wind Project is merely one in a chain of developments aimed at building Ontario’s capacity for relying on renewable energies. With few, if any, doubting the current need for reduced greenhouse gas emissions, the project seems like a clear win for all residents of Ontario. Sadly, this is not the case. Begin to drive around the island and you’ll immediately notice the multitude of signs standing like minuscule siblings to the wind turbines which tower over them. “No turbines for Amherst”, they read, their sheer number giving a clear indication of the community’s consensus. Since the beginning, residents of Amherst have been highly vocal of the project, accusing it of being financially unviable, aesthetically unappealing, and ecologically ruinous. Snowy Owl, meet turbine. Photo by author. Given Amherst’s abundant bird population, the project’s threat to the island’s ecosystem is even more pressing. Aside from the significance of the island as a prominent owl breeding location for Southern Ontario, the added benefit to tourism is a key element of Amherst’s economy. Though not a death sentence, wind turbines have been shown to adversely affect bird populations, and with the added uncertainty of their impact on already-rare owls, some residents fear the consequences the turbines will have on wildlife-related tourism. Given the amount of resistance on Amherst, the question emerges of why here? In a country known for vast expanses of sparsely populated land, surely there are alternative locations to build wind farms that would not upset residents or put key bird populations at risk. The answer to this question lies in one simple statistic: Amherst lies less than twenty kilometres south of Kingston. Focus the scope down from the entirety of Canada to Southern Ontario and the presence of those vast expanses decreases radically. Now the question changes from where to put the turbines so that they won’t upset anyone, to where would they upset the least number of people. Describing the decision to approve the project, the mayor of the township Bill Lowry stated: “All those rights were taken away from us… The provincial government was basically going to monitor and make sure we abided by the process”. Clearly, Amherst had no say in the decision to invest in renewable energy on their island. While the need for increased renewable energy is indisputable, the areas from which we draw that energy is fraught with competing interests. Does the relatively lower population density of Amherst Island justify the dismissal of their interests in building a wind farm there? With the majority of the project’s energy likely going to Kingston, why is it their smaller neighbours who are paying the price? The moral dilemma of renewable energies is clear. How do we as energy consumers in big cities justify the imposition of large-scale infrastructure projects on areas where we’ll never feel their impact? Surely if we are to benefit from the costs of our neighbours, be they farmers, suburbs or Indigenous communities, we must create mechanisms for distributing the resulting benefits. With the providing of compensations such as scholarships, jobs, energy subsidies and simple cash all feasible options, it’s worth questioning what Amherst’s resistance would have looked like had they been invited to share equally in the project’s outputs. Liam Ragan is a McGill student studying anthropology and environment. His main academic interests are conservation and how communities can be empowered to be stewards over and benefit from their natural resources. This has led him to work with Indigenous communities in both the Pacific North West and the South Rift of Kenya in their efforts to strike a balance between environmental sustainability and livelihood development. Liam Ragan is currently in his last year of a degree in Anthropology and Environment. His primary focus is sustainability and community based conservation, namely, how decentralizing authority over natural resources can lead to sustainable outcomes. Liam has to date ridden 4 species of megafauna, a number which he hopes to one day increase.